The Demon is intended to be Dodge's new performance halo. 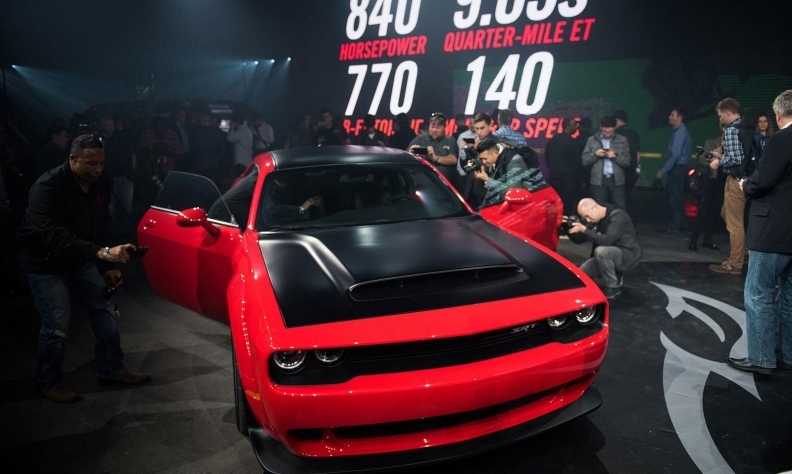 Three hundred 840-hp Dodge Challenger SRT Demons are headed to Canadian dealerships, but Fiat Chrysler Automobiles Canada hasn’t yet said how they will be allocated. The American arm of the automaker outlined a detailed distribution and ordering plan for the United States on Tuesday. But terms for Canadian dealers and their 300 units were not announced. FCA Canada spokeswoman Lou Ann Gosselin only said in an email that the news “applies to U.S. market only.” When asked by email when Canadian details would be made available, she didn’t reply. In the United States, Dodge will give priority to vehicles sold at or below the Demon's US $86,090 sticker price, including delivery and gas guzzler tax. Demons sold above sticker will be produced only after the "priority production" is completed. That will put pressure on dealers not to place immediate profit-rich markups on at least the first run of Demons, due to arrive in dealerships this fall. "We learned a lot when we launched the wildly popular SRT Hellcats," Tim Kuniskis, head of passenger car brands for Fiat Chrysler, said in a written statement. "We've taken that information and created an allocation plan that is clear and concise, builds on Demon's position as the Dodge//SRT halo and makes it easy for our customers to understand how they can put a Demon into their garage and, ultimately, out on the drag strip." When Dodge launched the 707-hp Challenger and Charger SRT Hellcats in 2014, some dealers tacked on tens of thousands of dollars in mark-ups, while others accepted and held hundreds of deposits from consumers even though they had no chance of receiving sufficient allocation to fill those orders. The process strained relations between FCA and some of its Dodge dealers. "We know some dealers may be tempted to sell to the highest bidder, but we are encouraging them to leverage the Demon as a halo for both the brand and their dealership, to bring customers into their showrooms and see everything we have to offer," Kuniskis explained in the statement. To qualify as a verified sold order (which establishes the price paid), an acknowledgment document must be completed and signed by the customer and dealer and be notarized. The acknowledgment document must be received by Dodge's Demon Concierge before production for the vehicle will be scheduled. The acknowledgment document also "provides a detailed list of safety considerations, technical specifications and features on the vehicle" to the consumer, Dodge said.